Last night while I was doing a few things, I turned on the TV and Places in the Heart was on one of the movie channels. It is just such an outstanding movie! As always, Sally Field is amazing! Whenever I watch that movie and see them picking cotton it always reminds me of three things: driving to the beach, my fourth grade science teacher and a colleague at my first “real” job. Firstly, it reminds me of that long awaited trip to the beach. When you knew a whole week of fun awaited you. When I grew up in the South, cotton was still a staple. I can remember going to the beach in the Summer and taking the back roads, you would drive by fields of what appeared to be snow covered flats of land, the cotton bolls bursting open revealing the delicate cotton candy fluff that waits inside. Secondly, I will always associate it with my fourth grade science teacher, Mrs. S.. She told us a story about picking cotton when she was a small girl of 7. We were studying plant life and one thing led to another she shared this story with us. She would stay with her grandparents every year during the later part of Summer. They had a farm and one of their main crops was cotton. She was fascinated by it and wanted to try her hand at picking. Her grandmother warned her against it. Explaining to her that her little hands were too delicate for the hard cotton boll because it would slice into her fingers like a knife. Still, she persisted. Her grandmother finally relented and made her, her own little cotton picking apron and bag. She rose early and went out to the field with her grandfather. It was fun at first, but it didn’t take long before her fingers got their first deep cut. The cotton boll shaving through her gentle little 7 year old fingers. By the time her day was done, Mrs. S.’s hands were red raw, gashed here and there and swollen. Her grandmother made her soak them in a hot bowl of water with epsom salts, applied ointment to them and gingerly wrapper her tiny hands in bandages. 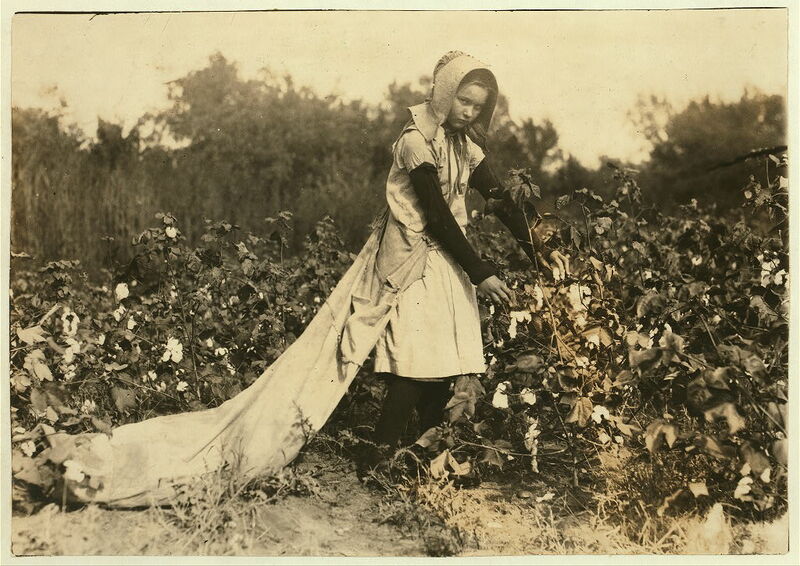 To this day, her hands still bear the mark of her first and last cotton picking session. Cotton picking also brings to mind a wonderful woman I used to work with at my first “real” job. I worked in a department store in High School one year to save Christmas money. One of the ladies I worked with was a Southerner through and through. Her family hadn’t come from much and her mother picked cotton to earn extra money. Now, they say that you don’t remember things under a certain age. I don’t hold with that philosophy. Neither did my co-worker. She was only 3, but she can remember vividly what it was like to be out in the fields with her mother. She was a small child during the 1930’s and at that time the baby of the family. Her mother took her to the fields with her. Her mama would dress in long sleeved blouses and wear a bonnet to keep the sun off of her face. She would dress my co-worker similarly and once in the field she would place her in an old wooden peach crate and would sit it at the end of the row. When she had picked her way through, she would move her to the next row, so she could keep an eye on her as she worked. My co-worker would nap, or play with her dolls or watch her mother. She could remember it like it was yesterday. I love how their stories had intertwined. From one generation to the next and the next, cotton still played a part in so many people’s lives. We all bring a different piece of thread to the tapestry to make up the whole. This entry was posted in Life and tagged Movies, Places in the Heart on December 19, 2013 by jennifermichie.